The town of Kramer was incorporated on September 5, 1883, and given the name Bremen. 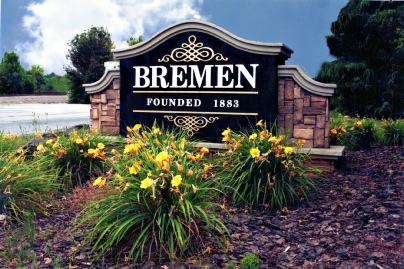 It was originally named for a German immigrant that owned a local vineyard but the name was changed at Kramer’s request to honor the city of Bremen, Germany. Bremen’s economy was given a significant boost when the Chattanooga, Rome and Columbus Railroad was built, crossing the Georgia Pacific at Bremen. This and other favorite circumstances have helped Bremen to grow from a simple railroad junction settled by German immigrants to the largest town in Haralson County, Georgia. Prior to the early 18th Century Bremen and most of Georgia was home to American Indians belonging to a southeastern alliance known as the Creek Confederacy. Today's Creek Nation, also known as the Muskogee, were the major tribe in that alliance. According to Creek traditions, the Creek Confederacy migrated to the southeastern United States from the Southwest. The confederacy was probably formed as a defense against other large groups to the north. The name "Creek" came from the shortening of "Ocheese Creek" Indians; a name given by the English to the native people living along the Ocheese Creek (or Ocmulgee River). In time, the name was applied to all groups of the Creek Confederacy. Most of the groups of the confederacy shared the same language (Muskogean), types of ceremonies, and village lay-out. The Creek people lived in large permanent towns or italwa with smaller outlying villages or talofa that were associated with the larger town. Italwa were centered around plazas (pascova) used for dancing, religious ceremonies and games. It was here that the Sacred Fire was rekindled annually at the Green Corn Festival (Busk). Plazas in the towns also contained a rotunda, a round building made of poles and mud used for council meetings, and an open-air summer council house. The people in the villages attended ceremonies in the towns with which they were associated. Surrounding the plaza area were the family homes. Towns were governed by a Chief, or "Mico", an assistant chief, and a "Mico Apokta", who acted as speaker for the Chief, announcing his decisions to the people. These characteristics are very similar to what is known about the prehistoric Mississippian Culture who occupied the Etowah Mounds village. The people of the Etowah Mounds are believed to be the ancestors of the Creeks who controlled the area until the early 16th century. Bremen is the home of Hugh McGraw, a noted scholar of American hymnody and the foremost expert in the Sacred Harp tradition of shape note singing. McGraw's Sacred Harp Publishing company is located in Bremen, as is the Holly Springs Primitive Baptist church, where he leads monthly singing schools and an annual all-day singing held in early June. The city was given the name Bremen by a local businessman to honor the city of Bremen, Germany. With an economic boost by the rail lines routed through the city, it began to develop a significant textile heritage. Discover the Quilt Trail, suits at Sewell's and more in this small Southern town. Thank you for visiting the city of Bremen, Georgia Website. Nestled in the gently rolling hills of West Georgia, Bremen is a place like no other. 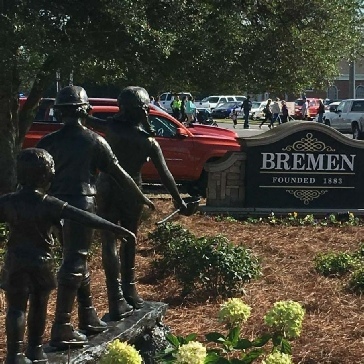 With a downtown marked by industrial heritage, a location that is convenient to southern backwoods charm as well as metropolitan culture, superior educational opportunities and first-rate churches and health services within minutes of home, Bremen is a traditional community that values long term progress. People are our most important product. Whether you are visiting us in cyberspace as a long-time resident, a community business partner or one seeking to move to a thriving community, we invite you to come, explore and discover our wonderful sense of community. Bremen is a delightful place to live, learn, play, work, worship and conduct business. We’d love to have you join us.